Feel free to judge away as you read this, I would. You know Costco muffins. Maybe you haven't bought them at Costco itself, but if you have ever had a muffin at a coffee shop or from a corner store where they aren't baked in-house, there is a very, very good chance they are Costco muffins. They are easily recognizable. First, they are huge. Seriously, 2x the size of something that would already be considered a large muffin. The diameter is impressive. And they weight a ton. They come in a few flavors: standard blueberry, almond poppy, or apple crumb, and then for the chocolate lovers, there are chocolate vanilla, chocolate banana, or double chocolate chip for those who don't even want to pretend this is "breakfast" food. And honestly, these aren't really breakfast food. Sugar is the second ingredient in all of them, after flour. They have about 50g of sugar each, helping make up their 700 calories. I told you they were hefty! I got a bit fascinated by Costco muffins after having one and uh, liking it. I found out some terrifying details, like that they have a 45 day shelf life, once they are brought to room temp (which is after they've been frozen at Costco, and frozen in the warehouses before that). They have many ingredients that are probably not meant for human consumption. They are miracles of food science. They last forever, even when barely wrapped up in flimsy plastic wrap. They don't get crumbly. They remind me of the mutant ice cream my dad discovered once that never melted. This was the first Costsco muffin I had. And I liked it. It was huge and dense. Very moist, particularly on top, where it was kinda a bit gummy. So generic, but totally endearing. It really was exactly what I remembered muffins being. I can't recall the last time I had this style of muffin in the past ... 10 years? 15? They are nothing like homemade, nothing like what I get fresh baked at bakeries around town. The completely amusing thing to me is that we have fresh muffins every morning at work. They are house made. They use real ingredients. And ... I got sick of them long ago. I passed up my office's fresh corn blueberry muffin in order to eat this Costco one. I can honestly say I preferred the Costco one, although I'm hoping it was just due to the novelty and change. I couldn't possibly like this thing based on its merits, right? It was loaded with poppy seeds. Seriously, so many seeds. They added a delightful crunch to every bite. The almond flavor is what really made it special. Most poppy seed muffins are lemon, which I don't like nearly as much. The almond flavor was just so nice. It was also insanely buttery. Well, I guess not buttery, uh, shortening-y. Part of the magic to keep it moist, and part of why its fat content is through the roof. These aren't really suitable for human consumption on a regular basis. I don't care how much you judge me, I liked this thing. If I was somewhere that had them, and I was hungry, I'd totally get another. I sorta wish I'd gotten two when I got this one, particularly now that I know I can keep it for 45 days. Shutter. Ok, so maybe I went back to the corner store where I found the poppyseed muffin to get another. The blueberry didn't look good, but they had only blueberry and chocolate banana when I went back. Whoops. Did I just admit that I went back for one? 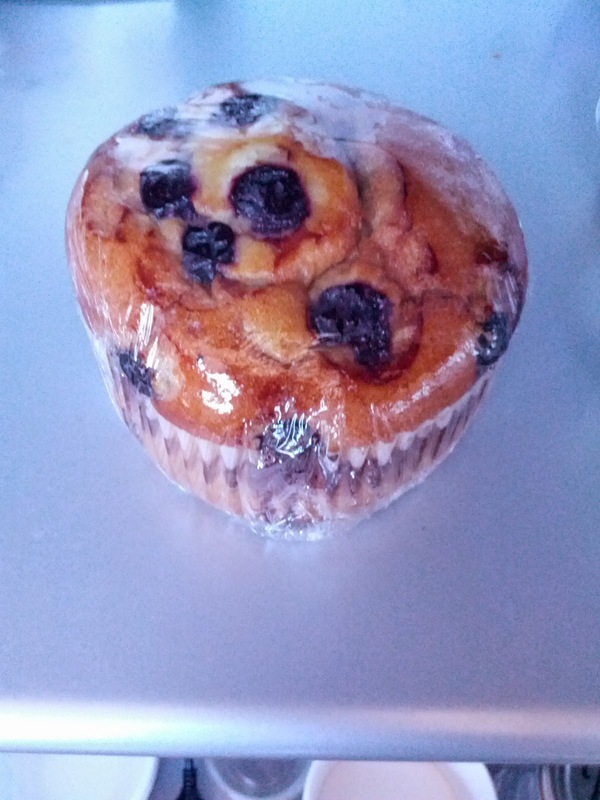 The muffin seemed very basic, just a plain muffin with some blueberries in it. It didn't have the lovely almond flavor that made the poppy seed muffin so special. The muffin was again very moist and dense. If you blindfolded me and fed me a piece of it, I would have thought it was poundcake, not a muffin. And, that is where this falls down for me. I haven't met a poundcake I liked. And seriously, this was a poundcake. The base way too sweet to really be a muffin. If you like poundcake, you would like this. The berries were impressive though, which I know sounds ridiculous, as I'm sure they were just frozen crap, but they were really moist and popped with fruitiness when you bit into them. 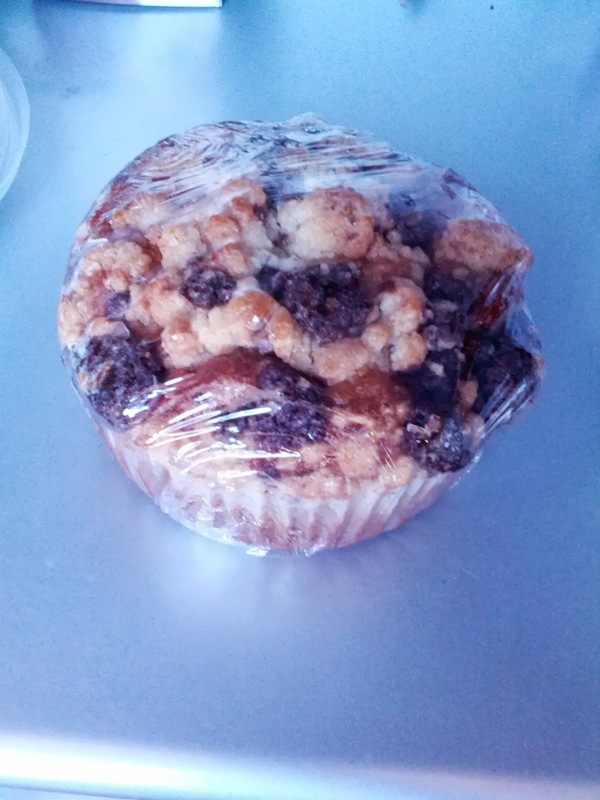 I was slightly fascinated by this muffin, mostly in how cakey it was, so I kept trying it, but pretty much hated every bite, and I certainly wouldn't get another. Ojan, who loves blueberry muffins, also refused to have even more than a bite of this. He independently deemed it a poundcake. I got this at the same time as the blueberry, again, it didn't look good, and I don't really like banana muffins, but they didn't have my precious poppy seed, and if that muffin taught me anything, it was not to judge. So I tried the chocolate banana. It was as bad as it looked. Dried out yet gummy moist on top. The chocolate chips were all on top, the rest was just a plain sweet "muffin" base, totally uninteresting. Again, it seemed like a sweet pound cake. Likely the same base as the blueberry muffin. It was banana flavored, but there was no evidence of actual banana - no chunks, no coloring, etc. On top was also some lighter colored bits, I guess trying to be a streusel, but they were dried out and flavorless.